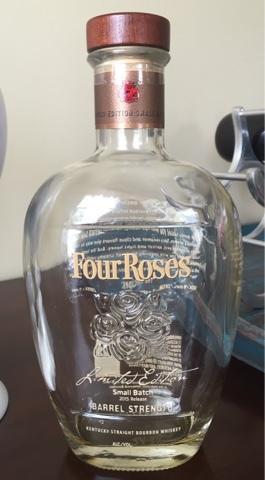 As I entered one of my favorite shops, I walked through the door, said my usual "hello" to the daytime manager and, as I turned my head just slightly toward the bourbon selection, my eyes locked in on the Four Roses Small Batch bottle sitting alone on a shelf in the store's glass cabinet. "That can't be what I think it is, can it?!?" I bee-lined it straight for that bottle, and my eyes must have lit up at the sight of the 2015 Limited Edition Small Batch, just sitting there, waiting for me to take it to its new home. Needless to say, I was happy to oblige! Knowing I was one of the lucky few to locate a bottle in the wild, for the longest time I struggled over whether to open it or save it for a special occasion. Luckily for me, New Year's Eve was only a few weeks away, and it provided just the excuse. What better way to welcome in 2016? The 2015 release is a blend of three recipes: OBSK aged 16 years; OESK aged 15 years; OESK aged 14 years; and OBSV aged 11 years. I guess that puts this release at an average age of 14 years, certainly well-above anything else Four Roses has on the shelves, including its private selection single barrels. When I first opened the bottle, I couldn't help but notice the fruity nose, mixed with cinnamon and vanilla. The nose was soft and inviting, and I eagerly poured my first glass. Though it's a higher proof bourbon, 108.6 proof, there was almost no burn. People frequently describe whiskey as "smooth." Well, this was smooth, but in a different way than I believe that term is so often use. This bourbon had a velvety smoothness to it, casually coating my mouth with sweet, rich and savory flavors all at once, and seemingly lingering forever. Up front I noticed strong flavors of caramel and pecans, relatively traditional in that sense. A very slight bite of oak hit the tip of my tongue right away, but that quickly dissipated. The caramel pecan flavor was underscored by cereal notes reminiscent of Frosted Flakes. After each swallow the back of my throat was coated in a butterscotch flavor that I found myself savoring before going on to the next sip. As I said, this bourbon really coated my mouth in a sweet, velvety smooth texture that just didn't want to go away. Later through the bottle some of the rye spices I've come to expect from Four Roses came through, coupling well with the sweet cereal flavor to provide something akin to an amaretto flavor, though it took me a while to place it. The last few dregs were very caramel heavy, making it very much a dessert whiskey! It was incredibly enjoyable, and became increasingly more so the more I had! I counted myself lucky being able to grab one of these bottles at retail, particularly since it has been touted by many as the best release of 2015. While I never made a top bourbons of 2015 list, there's no question that this one is at least in my top three.